Background: Expressed emotion is a measure of a relative’s attitudes and behaviors toward an ill family member. Originally developed and studied among patients with schizophrenia, the construct has been found to be a robust predictor of treatment outcome and relapse across a number of mental and physical illnesses. Objective: This review updates the current literature on expressed emotion and eating disorders. Method: Electronic databases (PsycInfo, PubMed, Ovid) were searched with the search terms “anorexia nervosa”, “bulimia nervosa”, “binge eating disorder”, “eating disorder”, and “expressed emotion” from January 1985 to July 2018. 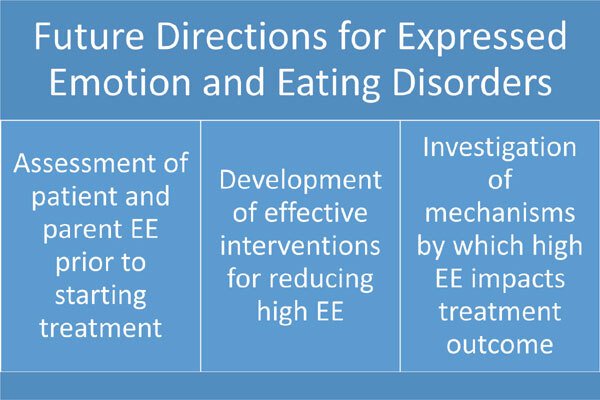 Studies were included in the current review if they were published quantitative studies assessing EE and eating disorders that were not included in a previous review, and were written in the English language. This resulted in 30 studies assessing EE and eating disorders included in the current study. Results: The review highlights the association between parental criticism and treatment outcome, patient and parent characteristics associated with expressed emotion, bidirectional examinations of expressed emotion, how the construct fits in the context of a theoretical model of eating disorders, and development of interventions assessing changes in the expressed emotion. Emerging evidence suggests that even low levels of parental criticism may be associated with poor treatment outcome, perhaps particularly for patients with anorexia nervosa. Conclusion: Drawing on the schizophrenia literature, clinical implications and directions for future research are discussed. Keywords: Expressed emotion, eating disorders, anorexia nervosa, bulimia nervosa, binge eating disorder, treatment outcome. Keywords:Expressed emotion, eating disorders, anorexia nervosa, bulimia nervosa, binge eating disorder, treatment outcome. Abstract:Background: Expressed emotion is a measure of a relative’s attitudes and behaviors toward an ill family member. Originally developed and studied among patients with schizophrenia, the construct has been found to be a robust predictor of treatment outcome and relapse across a number of mental and physical illnesses.